A very important skill to have when placing steel beams or landing skids of block or transporting heavy bundles of roofing is precision. This particular skill helps to keep both pedestrians and operators protected for everyone around them. Telehandlers engineered and manufactured by Lull are the favorite choice of masons every time. They have the reputation of meeting their mark every time. The traversing carriage on Lull Telehandlers enables you to move a whole cargo horizontally at 80 inches or full height. These models are able to lift up to 4000 pounds 54 feet high as well. Lull has particularly engineered their equipment to give operators the control and confidence they require to load and land at extreme heights. Furthermore, Lull provides the Stabil-Trak system. This particular system greatly increases the confidence of the operator by automatically transferring from a 3-point to a 4-point stance. Lull provides many optional attachments to fit their already exceptional equipment. This helps to guarantee better jobsite flexibility in every equipment. The company also provides parts, service, and training experts to help you with any problems you may have. The company remains devoted to helping you do whatever it takes to maintain uptime of their machines. The Lull Telehandler is popular in the business for helping you stay on target all the time with extreme precision and performance. The exclusive horizontal load placement system is part of all Model 644E-42 machines, which provides a combination of additional performance enhancing features and attachments such as the Stabil-Trak system. The Lull Model 644E-42 has what people need to complete the task efficiently and safely with more effective load positioning. 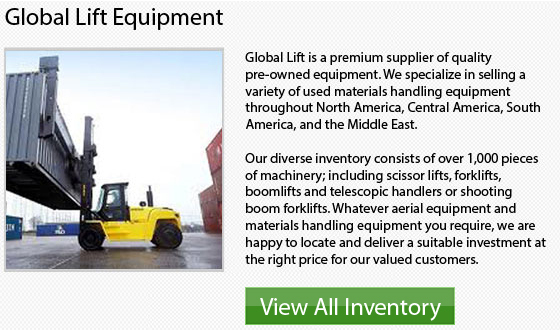 This particular unit provides a Max Lift of 12.8 meters or 42 feet and a Max Capacity of 2722 kg or 6000 pounds. The benefits of the horizontal load placement system, more visibility and more power have been added to the Model 944E-42. These combinations make the Lull Model 944E-42 Telehandler an extremely productive powerhouse on any jobsite. Along with its 9000 pound capacity and the full line of attachment options, you would have versatility to spare. The Model 944E-42 has a Max Lift of 42 feet and 12.8 meters, along with a Max Capacity of 9000 pounds and 4082 kg.